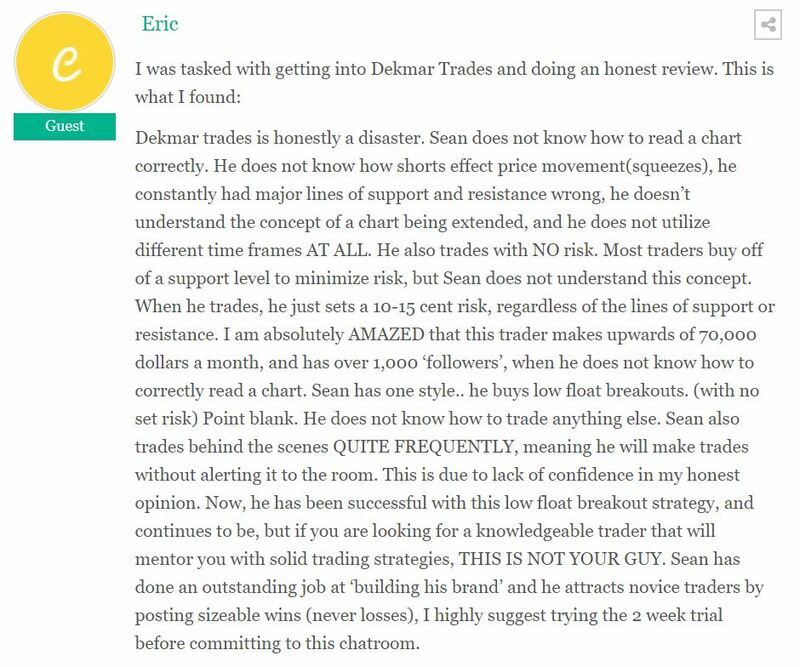 Dekmar Trades Review – My Brutally Honest Opinion! Sean Dekmar is the owner of DekmarTrades.com, an investment website that teaches novices how to day trade penny stocks. Everyone knows the penny stock market is prone to manipulation and scammers looking to profit from naive millennials. Sean is another “guru” banking big bucks selling education to beginners but at an affordable price. His membership prices are reasonable, $59.99 per month is a lot cheaper in comparison to Tim Sykes and Investors Underground who charge premium prices. Dekmar Trades offers nothing unique, he sells access to live chat rooms, video lesson library, daily watchlists and custom scanners. Pretty much every stock market teacher online provides a live chat room, video lessons and weekly webinars etc. Currently, Sean has 1,000 members, that’s one thousand people paying him $60 each month. $60,000 per month is nice passive income, it won’t be long until he’s making a million every year from subscription sales alone. In addition, he sells merchandise such as hats, snapbacks, and t-shirts to promote his brand and earn extra money. As I have mentioned before a dozen times on this blog, teaching beginners how to trade is very lucrative. Sean can make $3,000 to $10,000 trading providing he has a good month while he can earn $40,000 – $60,000 per month selling products. It takes some people a year to make that kind of money! At least Sean isn’t too greedy and trying to squeeze every last penny from customers. For December he gave away a free month to current subscribers which was quite generous of him. Sean likes to trade stocks in the 0.25 cents to $25 range but mainly trades penny stocks as they are more predictable. His most successful strategy is buying low float breakouts based on press release news. He primarily focuses on trading psychology and technical analysis to gain an edge. Apparently, Dekmar claims to have a 73% win ratio which is excellent but I’ve seen no proof to back this up. Sean asserts the key to success is cutting losses short and letting your big gainers run. In theory, this sounds easy to follow but difficult to put into practice. Ideal for beginners who can avoid joining expensive chat rooms that offer limited education and just pump penny stocks. Free two-week trial to try out his service risk-free. Clearly Dekmar is confident members will like his service and sign up for a monthly or annual membership. His marketing isn’t obnoxious like douchebag traders such as Cameron Fous, who advertises this fantasy trader lifestyle. “Learn to trade penny stocks and make profits travelling around the world”. Second day in @DekmarTrades chat . Oh man i made soooo nice trades today and learned some things that i didn´t know bevore. Currently, there are no testimonials on the website that can be verified. A quote from someone named Thomas Mihalyo isn’t sufficient who knows if this person is even real. There are not many reviews available probably because Dekmar’s affiliate program doesn’t offer big enough commissions to attract stock trading websites to post fake positive reviews to make money. No brokerage account statements released to verify trades and could be cherry picking his best trades to post on Twitter to attract new members. Dekmar heavily promotes Trades Ideas to earn extra affiliate commissions. It’s easy to trade without emotions if you have a second income to fall back on. He is relatively inexperienced in comparison to the top penny stock traders. I don’t think Sean has even made more than $100,000 trading. Example of Watchlist he emails out to members on a daily basis. “Happy Hump Day, today kicks off a brand new trading day and as always I am very excited to see what it brings. Right now we are back into a November like market of low float runners. This means focus highly on the low float stocks with zero to only a small gap up as these are the stocks that can bring in the big profit. 90% of stocks that we have seen have gap ups this week have not been able to hold its gains, $PTI was one of the only ones. What am I doing at the bell? I am watching the HOD momentum scanner, sitting back, and seeing what low float stocks appear that could lead to easy profits! 1/2 on All Alerts Yesterday! It’s difficult to tell if Dekmar Trades is a legit trader so I’ve signed up for the free trial to test out his chat room. Personally, I would rather learn from someone who has more experience and verified profits. Worst trader ever. Im now a 100% more profitable now 6 months out of this room waste of time. I have tripled my account on my own. He does understand the core trading strategies and trader phycology and puts his followers accounts at risk by selling early. Cost me over 6k and refuses to refund me the remainder of my 6 month trial when I wanted a refund. Stay clear. Goob job on recovering your loses. Did you join another community ? hhhhmmmm, Where do i start? This guy is a chatterbox, talks waaay too much and at least if he would say something different but repeats the same thing over and over again to a point where it gets annoying after a while. Sean is limited to one thing only, which is buying breakout for 5-10 cents and that’s about it. Very limited technical knowledge and to one thing only. He has a shorting chatroom, but he has no idea how to short. Clueless when shorting stocks. He does not stay in the trade more than 10 -20 seconds, when buying a breakout. That is what scalpers do, but I would not call him a true scalper. In general, if you attempt to copy a scalper, most of the time, traders lose their dollars, because they would buy and sell after their “mentor” .He lets the chatroom know that he is in the trade few seconds after he submitted a market order. 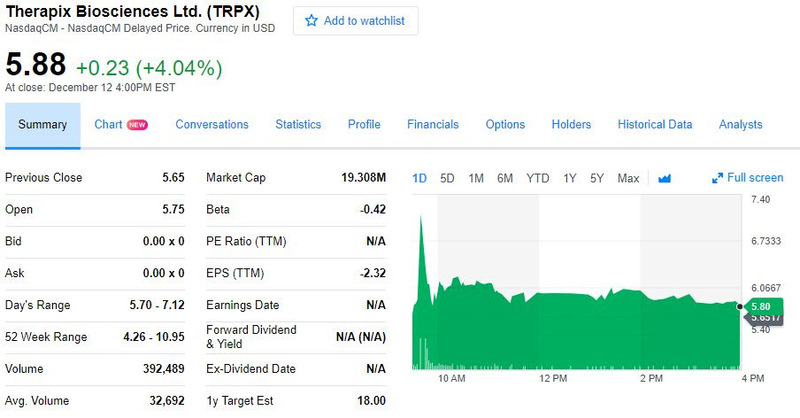 If you have 1000 folks following, this will push your shares up few cents 10 seconds later, so profiting makes it easier for him. Sometimes, he draws support and resistance lines incorrectly. As a member , you do not expand your knowledge about new strategies or indicators besides, u shape pattern, ascending triangle and that’s about it. Bottom line, he is a sub-par trader. He may be ok for beginner traders but do not waste your time in him chatroom for a long time if you want to expand your trading knowledge and be a better trader. By the way, he calls bollinger bands, boiling bands..:LOL. Bro, open up a book and read it properly. The guy is a straight up scam artist and only interested in sucking as much cash out his channel subs as possible. I signed up to check this guy out and see if there’s a real/rare story to be told here so let me tell you something, it’s fools gold and if you think you’re going to get anything decent from his channel, think again. I signed up and right from day dot the guy has no clue what he’s talking about, he talks a lot for someone with no real insight/knowledge towards the market, but that’s because he constantly repeats the same lines over and over again. The guy barely trades and I really do mean that, lucky if you see 1 trade per week off the guy and low size at that, he solely depends on his monthly channel income from all his subscribers paying over $100 each per month so he’s netting in 50k+ from them, this right here should be the massive red flag, a “day trade” taking 1 trade per week and even sometimes he would go 2 weeks and not take a single trade? Anyway, I sat there and watched him go 3 weeks without going into anything, actually he did buy into 1 stock but extremely small size taking a $150 loss, he then brings up this stock around lunch hours saying to the entire channel (600+ people by the way), “watch this stock guys it’s gonna pop, keep an eye on it”. Now as soon as this happened I knew the guy was at it, daylight robbery at it’s finest here, the stock has almost zero volume, gapping about the place on the 1 minute chart so terrible chart structure along with zero volume = deadman’s zone were no half decent trader would dare tread, yet he kept repeating the same thing for a good few hours, “It’s gonna go big guys, really big watching it here”. So after Sean Dekmar hyping up a dead stock on his channel for so long the people in his channel start to buy this lol, and I know it’s the channel because the volume is still crap and could only come from this channel then all of a sudden Sean Dekmar hits out with, “Hey guys made 11k on this baby”, at which point some people in his channel got very angry with him because one of his moto’s he always gloats about is how he is “always transparent” to the channel, yet this trade he made purchasing around 12k shares on the morning went to no one’s ears but his, he never once mentioned to the channel on this day he bought in heavy on this stock shortly after the open, he only announced he was in ANY trade at all when he got out and made the profits. Now people in the channel instantly called him out saying he’s just a con artist pumping up dead stocks faking his own channel members in to buy it, these comments were quickly deleted by him, why would someone delete these instantly if not to try shove aside the fact he did infact just scam out his own channel for 11k cash profit…. Bit of a long winded story here but I would to really clear this up and give you some insight on what actually goes down in this scamming channel, Sean prays on fish hooking in as many people as possible to keep up his monthly 50k+ income living the good life, he does his best to talk a good game just like any other good con artist does, but in the end all that happens here is the customer losses out big time. You have been warned, stay away from this guy and other channels like it. Dekmar…scam artist who lives on his chatroom subscribers. I wasted two years as a newbie being in his chat, learning nothing. He would make a great sports commentator.